Wonderful Waterfront Paradise! 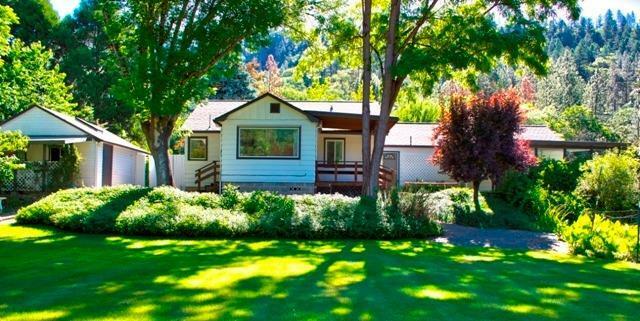 This adorable park-like setting and immaculate home with large detached 3rd bedroom or as an additional living space that is perfect for an office, exercise room or rec room is located just a 1/2 mile outside of the town of Rogue River and sits up from the banks of a beautiful year round creek. This single level home has amazing views of the mountains, gorgeous lawns to the creek's edge, and fruit trees. It also has covered RV or boat parking, a 2 car attached garage, a covered carport and a 16 X 12 stick-built shed. The house itself is spotless and has a spacious kitchen, 2 bedrooms and 2 baths, nice sized living room, dining area, and sitting room. New heat pump in 2016, dual pane vinyl windows, privacy fencing and an irrigation system with water rights from the creek. All information is deemed reliable but not verified; anyone considering purchasing this property should perform their own investigation into the uses and condition of the property.